Do you like traditional weighting football pools for playoffs without all the hassles? You’ve come to the right place. Our NFL playoff confidence pool picks offer exciting features with a number of configuration options for an experience that keeps you engaged. We also offer comprehensive stats and performance indicators to provide a clear picture where you stand against other players. Create a playoff confidence pool and start today! Each playoff week you pick a winner for every game, and place a "weight" on each game from 1 to 11. Once you use a weight on any game you can't use it again in a subsequent week; that is, you'll spread the 1 through 11 weights across all games throughout the playoffs (there are 11 total playoff games including the Super Bowl). The player with the most points after the Super Bowl wins! Standings page showing current leaders and all player's picks. 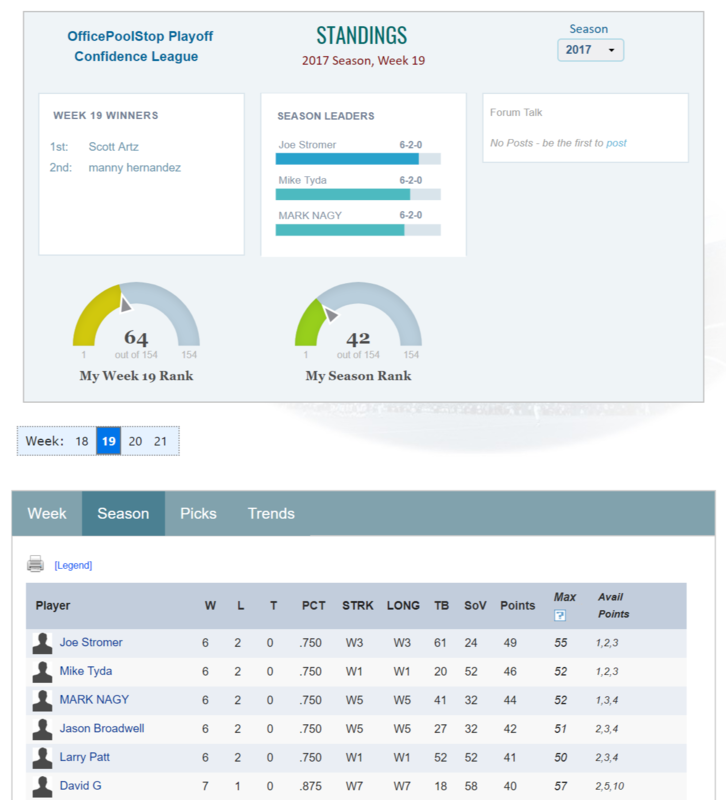 Each playoff week the Standings page shows the max possible score players can reach, and the points still available. Comprehensive, life-long stats on your confidence playoff league and your individual performance. Possible inclusion in the Playoff Confidence Hall of Fame and Hall of Lame. Specify weight value lost for games that are not picked. You can optionally use traditional confidence weighting, where you select the weights available to use for each playoff round. Final season prizes for 1st through 4th place, best tie-breakers, and best Strength of Victory. One custom prize, where you name the prize and set the winner when appropriate (for example, "best win-loss record"). "Bye" week feature that allows a player to forget a week and not be out of contention. If enabled, the worst playoff week for each player is subtracted from their total points (only total points are affected, other stats such as win-loss record remain intact). The Standings will indicate the bye week determined for each player. Tracking of player league fees, per-player note annotation (e.g. "player paid me in cash on Friday"), and optional notification to the player when they log in to the site if they have a balance due. Comprehensive, life-long stats on your playoff confidence pool and your individual performance, including possible inclusion in the Hall of Fame and Hall of Lame. Branding your office football pool to your own look&feel. You pick background colors and upload your own logo. You also get your own login page.